Is your cat scratching a lot lately? Is she chewing her skin or restless? Is she suffering from loss of appetite, lethargy, and even Anaemia? If these are some of the symptoms or behaviours you have noticed recently then the probability for flea and tick infestation is quite high. Fleas and ticks are one of the most common pests for pets or domestic animals and they can be quite the nuisance. They are normally prevalent around the warmer months and can carry or cause diseases including Cytauxzoonosis, Tularemia or Rabbit fever, Feline infectious anemia or Feline hemotropic mycoplasmosis, Babesiosis, Ehrlichiosis, Plague, Cat Scratch Disease (CSD), Flea Allergy Dermatitis, and Haemobartonellosis. So, what could be the possible treatment for removal of cat fleas and ticks? There are different types of medications and home remedies available but one of the most popular and highly effective is the PetArmor Plus flea and tick treatment for cats. PetArmor Plus flea and tick treatment for cats is being manufactured and marketed by FidoPharm, which makes high quality pet medicine more affordable. PetArmor Plus comes from one of the leading companion pet health product companies in the world, which is committed towards providing consumers with some of the most comprehensive products. These companion pet health products contain the same active ingredients that have existed in the market as branded veterinary health products and all this comes at a significantly lower cost. PetArmor is available for both dogs and cats and focus on keeping your pet free from fleas and ticks. PetArmor Plus is available in the form of topical pipette that are easy to apply. You don't have to worry about forcing a pill down your cat's throat as this medication can be applied directly on their skin. PetArmor Plus kills ticks including those that are responsible for transmitting Lyme disease. The pack comes with 6 applicators that provide a rapid-acting, long-lasting, and waterproof protection to your cat for a period of 30 days. PetArmor Plus topical applicator contains an effective composition of insecticide and insect growth regulator that enables it to not only kill fleas, chewing lice, and ticks but also their eggs and larvae. 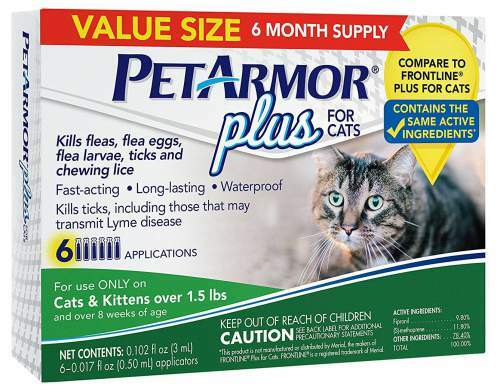 PetArmor Plus starts killing fleas within 12 hours since its application on your pet. It may take almost 48 hours for the medication to start killing ticks though. Fipronil: PetArmor Plus contains 9.80% Fipronil. It is an active ingredient, which is a broad-spectrum insecticide that kills fleas and ticks by disrupting their central nervous system. ​(S)-methoprene: PetArmor Plus contains 11.80% of (S)-methoprene. This is as another active ingredient and it is an insect growth regulator (IGR). It is responsible for interfering with the growth cycle of fleas and ticks and thus ends up killing eggs and larvae. Any side effects using PetArmor? Once PetArmor Plus is applied, some cats may not show any side effects while symptoms may appear in other cats. The symptoms normally appear after a few hours since application and the type of side effects depend primarily on the formulation (ingredients) and dosage. Some of the common side effect or symptoms in cats include Ataxia or uncoordinated movements, twitching, aggression, Hyper-reactivity, nodding, sweating, sudden convulsions, nausea, vomiting, lack of appetite, abdominal pain, headache, dizziness, agitation, Abnormal gait, and weakness. It is highly recommended to consult a vet before applying this product on an aged or debilitated cat. Overall, Pet Armor is one of the best flea medicine for cats and Fast acting and long lasting medicine that which provides a long lasting flea treatment for cats that protects from flea bites upto 12 weeks.